Suss out the local shops – Do you know where the supermarkets and other options for groceries are? Are they likely to have what you need? 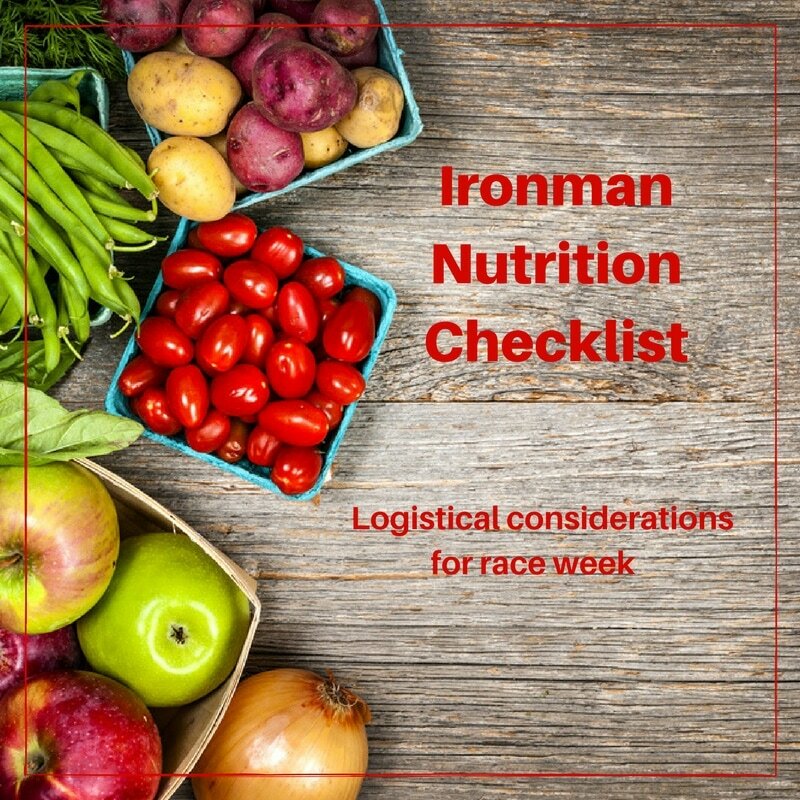 Sometimes the simplest things can be the hardest to find – banana shortages are common during Ironman week! Will you need to eat out on occasion? If so, try and make any restaurant reservations early as with so many athletes in town, your choices may be limited if you just wing it, and no-one wants to deal with a stressed out, hungry, tapering athlete! Improving and correcting your posture is one of the healthiest things you can do for your spine and your whole body. Not only does good posture make us look great, but it is a key aspect to better health and a pain free body. Correcting bad posture does take discipline, but there’s no doubt the benefits are well worth the effort. The first step is to understand which of your lifestyle habits promote bad posture and then taking small steps to address these. Pesco et. al. suggests that once you have postural awareness, there is a significant decrease in upper back and neck pain1. Some experts say that as many as 80% of us will experience a back problem at some point in our lives2, not merely due to injury or trauma. In my opinion, prolonged poor posture has over 50% to do with the back and neck problems we see every day in clinic. Poor posture places unwanted pressure on the joints and discs of the spine, as well as the surrounding muscles and tissue structures. Prolonged poor posture can lead to spinal degenerative arthritis and degenerative spinal disc disease. Chiropractic can help alleviate the problems associated with poor spinal health such as neck, back, and muscle pain, and help reduce the risk of developing permanent spinal degenerative changes that cannot be correct once they have occurred. Chiropractors are experts at assessing the spine, examining posture, and locating problems. Through the use of adjustments, mobilizations, and soft tissue releases, Chiropractors can identify where the spine is not moving correctly, treat and correct these areas, help improve posture, alleviate any associated symptoms, and guide and motivate you to make beneficial lifestyle changes to maintain good spinal health and good posture. A healthy, flexible spine, is key to maintaining a healthy, pain-free, life. Imbalance of body posture can be a sign of imbalance in the spine. If you see any imbalance, it is important to see one of our Chiropractors and get it looked at and treated. Visit one of our Chiropractors Nicole, Elisabeth, or Mel, or our Exercise Physiologist Stacey to assist you and correct any postural ailments to help alleviate any problems that poor posture can cause such as back and neck pain. Download apps such as the CAA Back App from the Apple App Store or on Google Play and easily set up regular postural reminder alerts on your phone to use at the office, or at home. As many of you are aware last month I completed my first ever Ultramarathon. Never ever would I have believed I could achieve such an accomplishment 12 months ago. But it is a true testament to mental strength and what the mind believes the body can achieve. My training for this event surely had its ups and downs. My relationship with my program was tested on many levels. Early on you will recall I put a stress fracture in my femur which stopped me running altogether but this road block wasn’t going to stop my determination and as frustrated as I was of not being able to run I found a different avenue to continue towards my goal. I took up swimming and strength training as part of my cross training and after enough rest from running I gradually increased my running load again. Training was tough. I was up 2 mornings a week at 4.30 am to fit in my long runs of 30+ kms and get to the gym to work on strength. It was HARD to find time to train with a business to run and three little monkeys at home to take care of. I had to push my limits where I could. I ran to work, I ran home from work. I would run to friends houses and also run before my interval training. I have become familiar with the Royal National Park having run plenty of tracks during my training and became friends with the Honeymoon Stairs. If you haven’t endured the stairs they are no way a Honeymoon! Three weeks out from Ultra trail Australia 50 I entered in the Anzac Day Challenge which would be my last long run before the big event. It was a 40k run around St Ives and Bobbin Head. It was tough, the day was extremely cold and it rained sideways for most of the run. I didn’t feel up to scratch before the run but was committed to finishing it. It took 5 hours and 15 min to complete and my body was a wreck. A few days later I was suffering terribly with hip pain and back to the beginning could barely walk and had deep hip pain. My first thoughts were “here we go again” all I could think about was is this going to be another stress fracture? So off I went for an MRI on the left hip to rule out the worst case scenario. Three long days of waiting for results and the good news came in that there was no fracture but I did have a grade 2 tear in one of my hip muscles. This was not going to stop me, I had trained so hard, given up all of my valuable time to train. I trained in the dark, in the rain, in the cold. I had even gone home early from events as I had to train the next day. I WAS DETERMINED TO GET THIS DONE. On May 14th 2016 I lined up with my running buddies to compete in my first ever Ultramarathon. I had no idea what was ahead of me as I had only had trained once on the course and it was the back end of the run. I was as nervous as anything but excited that I had made it onto the start line. For those of you reading this that are not familiar with the course the event is held in the Blue Mountains. The course runs from Scenic World past the Fairmount Resort to the Old Queen Victoria Hospital on the Kings Table Land. It then descends into the Jamison valley and returns past the Three Sisters and back up to scenic world. The first 20m is stairs. Thank God I did not know that before entering the course. A half marathon of stairs greeted us before we even got into the valley. My legs were on fire by the time I finished the first part of the course. I remember saying to myself I don’t want to see another stair for the rest of my life! Once we passed the Queen Victoria Hospital I was in familiar territory as I had done this part in a training run so I knew what was ahead of me. It started with a 8km descent into the Jamison valley that tested every ounce of leg strength I had left and then once we had reached the bottom it was the march back to scenic world. The march was all I could muster for the 20 km up hills. It was tough and all that was running through my mind was just put one foot in front of the other and don’t stop. Often I would count my steps just to take my mind off the massive hills we had to walk up, they were relentless and nothing like hills here at home. At the bottom of the Furber stairs I could hear the finish line. I could hear the cheering and bells at the top and just wanted to finish this event. I was exhausted and had 951 stairs to climb to get there. The stairs almost broke me but I just kept going. I passed people cramping horrendously and at least one vomiting. People were struggling but I was not giving up. I marched up those stairs and got the top in under 20 minutes. Once at the top the adrenaline kicked in and after 49km and 951 stairs I started running again. I was met at the top by all my running buddies cheering me on. I couldn’t believe the support and love I received from my friends that supported me and helped me get to this point. They stood in the cold with cameras making sure they did not miss me finishing my first ever Ultramarathon. Please see the picture below to gain perspective of my elation. PS it took me 9 hours 15 min to complete. So what now? If the body achieves what the mind believes what is in for me next? 100km I hear you saying!! It has been quite some time since my last update on my running journey to Ultra trail Australia 50 km event. As most of you know I have been working hard on my fitness and strength o ensure that when it comes to race day I am fit and strong enough to finish the event. Late last year I was diagnosed with a Femur stress fracture. Yep that’s right I managed to put a break in the largest and strongest bone in my body. An MRI finally gave me the bad news as I had been unable to run and had been limping for a while. 8 weeks no running was my recovery with 4 weeks gentle resuming back into it. I am happy to say it has been 12 weeks since I found out and I am back into training. Sunday was my biggest run to date. 33km of trail running starting out in the National park with a head torch at 5.15am and finishing up 5hours later. I am still tired today 2 days after running but the endorphins are still flowing. After a long time off running I was starting to lose my motivation for it all. It had taken 18months of hard work to get to where I was before the diagnosis of a stress fracture and basically all that work was undone in 12 weeks. Lucky for muscle memory it wont take as long to get there but gosh is it hard work. So how did I end up with a stress fracture?? Running is more than physical fitness for me. It clears the head and gives me goals and something to focus on. I have a goal to do an ultra marathon in May and I freaked out that training more before that event would see me finish the event with ease. I am a driven person and like succeeding at anything I put my mind too. I probably got myself carried away with too much training and not enough rest in between runs which left me physically unable to repair small damage I was causing myself every time I ran. We have a lesson to learn from our mistakes and trust me I am always learning! My lesson hear was that I need to listen to my body, our bodies send us powerful information that our minds can over rule. My body was fatigued and telling me to slow down but my mind would overrule and I would tell myself no pain no gain in the end my body failed me beyond my mind and so it won at the end of the battle. If you have read this to the end a lesson you could probable learn from this is we all need to be more intuitive with our bodies and the messages it tells us. We shouldn’t ignore niggles, aches and pains because it is our body trying to tell us something. If you have an ache or pain or something niggling or you have digestive issues etc. get them checked out. Your body is trying to communicate with you. Principles and practices of phytotherapy: 2ndedition. Bone, K & Mills, S, 2013. Churchill Livingstone Elsevier. The clinician’s handbook of natural medicine: 2ndedition. Pizzorno, J, Murray, M, & Joiner-Bey, Churchill Livingstone Elsevier. Clinical Naturopathic Medicine. Hechtman, L. 2012. Churchill Livingstone Elsevier. How does your body hold stress? Everyone holds stress and reacts to stress in different ways. For example, one person may hold stress in their shoulders, lower back or neck, others hold stress in their gut (commonly associated with IBS and reflux) and others suffer from headaches when under stress. There are many more presentations or symptoms of stress. Lets face it…we are all stressed! The bad news is that experiencing stress is inevitable! The good news is that there are many natural ways of managing stress and just as importantly to reduce the effects of stress on the physiological function of the body i.e. reducing the way that stress affects normal bodily functions therefore reducing the impact that chronic stress has on the incidence of disease. In other words…stress wears out the body! Herbal medicines can be prescribed to support the healthy function of the adrenal gland (this gland regulates the stress response and is often poorly functioning in chronic stress) and reduce the effects of stress on the body.